Okay, so not long ago Warner Bros. revealed its slate of upcoming movies based on DC Comics properties. On that list was Fables. So, I think now might be a good time to talk about that one. At the same time, part of me thinks that I shouldn’t have to post about this one at all. I mean, who that’s either a fairy tale fan or all around geek doesn’t know about Fables. Nevertheless, here we go. Fables is a comic book series written by Bill Willingham and drawn by Mark Buckingham that’s been part of DC Comics’ adult-oriented Vertigo imprint since 2002. The series focuses on a number of characters from fairy tales, nursery rhymes and classic stories who are forced out of their own world, which they call the Homelands, by someone they refer to as The Adversary. Having left their home, they establish a secret immigrant community called Fabletown in New York City. The plot focuses on the lives of the Fables (what the characters call themselves) as they try to keep the community secret from the Mundys (what they call regular people) and as they try to find a way to retake their Homelands. The best way to describe the story is that it’s fairy tale noir with elements of high and low fantasy. Among the characters are the sheriff of Fabletown Bigby Wolf (the Big Bad Wolf in human form), deputy mayor Snow White, their seven children (that one’s kind of a long story), Snow’s sister Rose Red, Little Boy Blue, Prince Charming (Snow’s ex-husband and all-around cad) as well as many, many others. Seriously, this comic has one of the biggest ensemble casts around. In terms of Vertigo comics, this is one of the biggest ones around. It was so popular that it spawned two long-term spin-offs Jack of Fables and Fairest (not pictured below) as well as a couple of miniseries based around super-spy Cinderella (yes, you heard that right). There was also a novel, a downloadable computer game and a Fables TV show was once in the works at ABC (shortly after the Fables show fell through, Once Upon a Time debuted. Naturally, Fables fans lost their minds all over the internet). Now, I actually read Fables for about 11 graphic novels worth of material. I can tell you this: it is very well written and well drawn. I can also tell you just from my own understanding of fairy tales and folklore that it is amazingly well-researched. 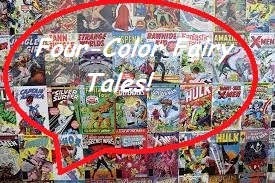 I also happen to know that it changed howmany comic book fans looked at fairy tales. It also set the path for any number of fairy tale related comic books that came after. However, I also have to admit one thing. It wasn’t one of my favorites. You’d think it would be based on the concept alone. However, there was always something that kept it out of my top seven. Maybe I had a hard time connecting with the “fairy tale refugee” experience. Maybe it was something about the characters. I had a hard time developing a real liking for or interest in any of them. While Bigby Wolf was pretty much the favorite of most Fables fans, I wasn’t ever interested in him just because I didn’t think casting the Big Bad Wolf as a good guy was all that novel or interesting. There was one exception. I really liked Flycatcher (aka Prince Ambrose, aka The Frog Prince). For the most part, he was just so idealistic and he had a tendency toward nonviolence that I liked while at the same time being very impressive as a leader. It was something very few people seemed to expect from him (which is strange, considering how we really should expect that there’s something more beneath the surface with the Frog Prince). It could be some of the choices they made with the other characters. Their version of Jack was a total scumbag, which upset my inner child greatly. I also hated the Fables take on the Seven Dwarfs and thought their take on Little Kay from “The Snow Queen” was oddly dark. Of course, that’s probably it right there. Fables was ultimately a little too dark to be one of my favorites. I know the mantra these days is that fairy tales aren’t the light and fluffy stories people once thought they were. I’m not completely against dark stories, but when it comes to dark stories I tend to get a little picky as to how the darkness is utilized. One should note that with folklore in general, darkness and light often comes down to interpretation. My interpretations often tend to walk a tonal middle ground. But that’s Fables for you. It’s dark. It’s gritty. It’s grown-up. It rarely pulls its punches. It’s amazingly well-written, well-drawn and well-researched. It brought fairy tales into comic book stores. Ultimately though, it’s not for everyone. The series is ending soon, as described in this video. I can’t give the series a negative review because I know it’s a quality book and I can’t rave about it because it’s not my “cup of tea”. However, I will say that if what I described sounds good to you, than you should by all means check it out. It can probably be found at a nearby public library or at a big bookstore. However, if you are going to buy it, I suggest supporting a local comic book shop. You can find one by clicking here. Thoughts on Fables? Post in the comments below. This is an excellent review! Having read a lot of Fables myself, I'd say this is a fair and balanced summary and explains why it's not everybody's cup of tea. Should I have people ask questions about Fables in future, I'm going to recommend they read your take on it as part of their consideration. Thanks Adam! It's probably the most unusual positive review I've ever given anything. But then, I never expected to be reviewing anything since my tastes can be a little odd.